Best known for a pair of adult contemporary smashes — "Please Don't Leave," a duet with Michael McDonald, and the Pretty Woman soundtrack's "Fallen" — Lauren Wood has parlayed a variety of talents into a career spanning two decades, while still evading most of the limelight. A native of Pittsburgh, Lauren Wood began her career in Rebecca and the Sunnybrook Farmers, a psychedelic rock band. Later taking the moniker Chunky, she and her cousin Novi formed the band Chunky, Novi and Ernie, which released its debut album in 1976 and featured Wood on vocals and keyboards. Having moved to Los Angeles, Wood recorded another album with Chunky, Novi and Ernie, as well as singing with fusion outfit The Freeway Philharmonic. 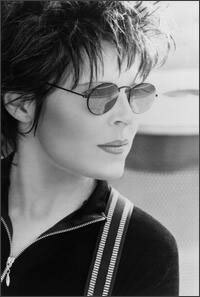 In 1979, Wood recorded her self-titled debut album for Warner Brothers, which contained the hit ballad "Please Don't Leave," a duet with the Doobie Brothers' Michael McDonald that made the Top 30 on Billboard's singles chart as well as the adult contemporary Top Five. After the follow-up, Cat Trick, Wood seemingly disappeared for a while. She spent much of her time writing songs for other artists and for film and television soundtracks; her material has been recorded by Gladys Knight ("Send It to Me"), Philip Bailey ("Echo My Heart"), Cher, Dusty Springfield, Animotion, Tiffany, Nicolette Larson, Sammy Hagar and Montrose, and Billy Preston, among others. In addition, Wood contributed vocals to television commercials and other artists' recording sessions, co-wrote and directed a parody of Ed Wood films entitled They Must Be Told, and founded a successful greeting-card company, Cat Tricks, based on photographs of her pet cats. In 1990, Wood contributed the track "Fallen" to the soundtrack of Pretty Woman, which went on to sell over three million copies in the United States; it became a much-requested adult contemporary radio hit and was covered by Johnny Mathis, Larry Coryell, and Nicolette Larson. The success enhanced Wood's freelancing career as a songwriter, as well as her ability to expand her Cat Tricks company and establish her own record label, Bad Art. In 1998, Wood released her first solo album since 1981, which, like her debut, was titled simply Lauren Wood; it featured the original version of "Fallen," new compositions, and songs that were recorded by other artists. Recently, Wood performed the theme song to the television series Just Shoot Me.